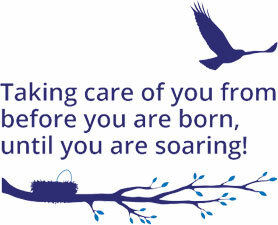 We look forward to taking care of your loved ones at Little Bird Pediatric Dentistry. Please see the listings of our services below. Click on each drop down for more information. Why: Our philosophy of care at Little Bird is for maximal optimization and prevention, to therefore avoid or minimize treatment and correction at a later, older age. This is why we work collaboratively with pre/post natal health care providers, to see babies within the first two weeks of life– ensuring optimized tongue and lip rest posture, nose breathing, sleeping and feeding that will optimize their growth, development and function. Note: The dental profession’s guidelines which are aimed towards cavity prevention are for all children to be seen for their first dental appointment when their first tooth erupts (around 6 months of age), or by their first birthday. However, at Little Bird, it is our goal to optimize the growth, development and function of our children, and that begins at birth. Referral to affiliated partners that may include: lactation consultants, bodywork (i.e. osteopathy), dietitian/nutritionist, speech language pathologists, etc. WHEN: All children will be seen as soon as possible upon receiving a request for an initial appointment at Little Bird from the parent, caregiver, or upon receipt of a referral from a health care provider. Little bird staff will assess the urgency of the request in order to determine the most appropriate scheduling. For example, children who are in pain or have an acute injury will be given top priority. Note: Patients with government sponsored dental coverage (i.e. Ontario Disability Support Program (ODSP)), a referral from your physician or dentist is required for booking your first appointment. As required, referral to affiliated partners that may include: physician, nutritionist, bodywork (i.e. osteopathy), dietitian/nutritionist, orthodontist, speech language pathologists, etc. WHEN: All those over 13 years of age (teens and adults) will be seen as soon as possible upon receiving a request for an initial appointment at Little Bird from the parent, caregiver, patient, or upon receipt of a referral from a health care provider. Little bird staff will assess the urgency of the request in order to determine the most appropriate scheduling. Individuals whom are in pain or have an acute injury will be given top priority. What is it? Oral myofunctional therapy (OMT) can be defined as physical therapy for the oral / facial musculature which is used to optimize the function of the tongue and facial muscles both at rest and during function (i.e. chewing and swallowing). The majority of what is above our necks is related to muscle (face, tongue, soft palate, airway). You can improve your breathing, swallowing and posture by exercising and retraining these muscles at ANY age. What do we address? With additional training in OMT, we can identify and address myofunctional disorders that may include, but are not limited to: mouth breathing, snoring, atypical (tongue-thrust) swallowing patterns, atypical chewing patterns, restricted/tethered oral tissues (tongue/lip ties), lip incompetence (lips apart at rest), and oral habits. A low tongue rest posture and/or tongue thrust swallow may be associated with a tongue and/or lip tie, oral habit (i.e. thumb sucking), or frequent utilization of oral products that train the tongue to be held down into the floor of the mouth. We pride ourselves in preforming a comprehensive assessment taking into account multiple contributing factors in order to provide the best care to our patients. Who would benefit? Individuals of any age that may benefit from OMT for oral myofunctional disorders may include those with: parafunctional oral habits like teeth grinding and clenching, lips apart at rest – lack of a lip seal, mouth breathing, drooling, low tongue posture, tongue thrust swallow, gagging, picky eating, bloating after eating, temporomandibular disorder (TMD), neck pain- postural problems (forward head posture),”long face syndrome”, sleep disordered breathing, ADHD, speech problems, dental malocclusion; crowding/crooked teeth, anterior open bite and posterior crossbites. What are tethered oral tissues (TOTS)? Lesson #2: What is a Tongue Tie – Ankyloglossia? 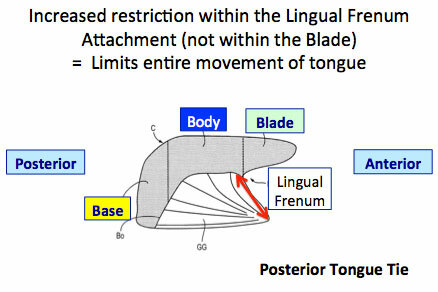 When the lingual frenum is short or inappropriately attached, it may restrict the movement, rest position, and function of the tongue. Anterior tongue tie is when the lingual frenum is restricted and attached more towards the tip of the tongue (See Pictures). A posterior tongue tie is less visible, and is when the lingual frenum is restricted between the floor of mouth body of tongue; restricting the movement of the tongue body and preventing an optimized rest position, movement and swallow (See Pictures). Best diagnosed with a thorough history (signs/symptoms) and clinical interactive assessment and examination (feel). Very commonly when there is a posterior tie there are submucosal connective tissue fibers further restricting the movement and function of the posterior tongue. This restriction can sometimes be felt during the exam, but more frequently are discovered during the frenotomy release procedure. It is of utmost importance that ALL restrictive fibers are identified and released in order to achieve optimal results and tongue function. Dr. Sigal ensures to provide this care, and advises families following the release if there were any submucosal fibers that were released (as the diamond oral scab/healing wound will appear slightly wider secondary to the muscular contraction of the surrounding tongue). 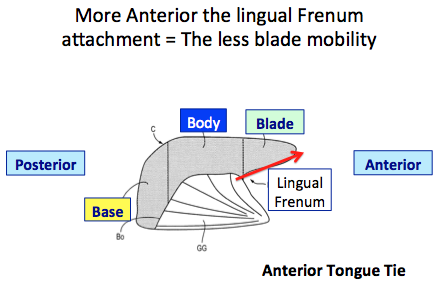 Anterior tie is when the lingual frenum (from the floor of mouth) is restricted and attached at any point along the red arrow of the blade of the tongue. The closer to the apex (tip) of the tongue, the more severe. 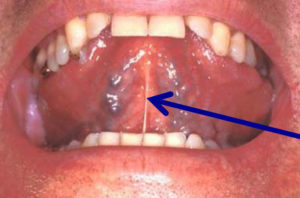 Posterior tie is when the lingual frenum (from the floor of mouth to the body of the tongue) is restricted (red arrow). This limits the movement and function of the body and base of the tongue. Lesson #3: What is a Lip Tie? When the upper labial frenum is short or inappropriately attached, which may restrict normal mobility and function of the upper lip. 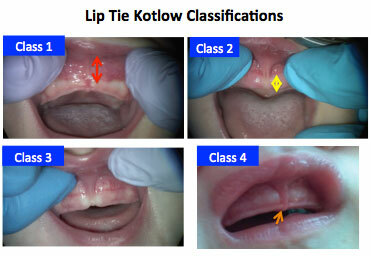 At LB, in conjunction with our comprehensive assessment, for lip ties we utilize the Kotlow classification system (See picture), but most importantly determine if a release is recommended based on a functional analysis. A lip tie release may be discussed if presenting with any of the three findings: Notable breastfeeding challenges (preventing deep latch, upper lip regularly folding inward despite positioning assistance, etc. ); Tautness puckering the upper lip towards the nose leading to an open mouth posture and increased tendency for mouth breathing; Cosmetic concern, creating a space >3mm between the top front teeth *Mostly in regards to the permanent (adult) dentition. At Little Bird, you will first meet with our new patient educator to learn about your baby’s breathing, sleeping, tongue and lip function prior to the interactive assessment/examination of your baby. During the assessment, Dr. Sigal ensures that you are involved. Following the assessment, treatment recommendations, procedures and post-operative care will be discussed. Our goal at LB is to ensure that our families feel comfortable every step of the way. If diagnosed and impeding your baby’s function, recommended treatment is to release the frenum / tie. The earlier the better (as less re-training/learning involved), which is why at LB we advocate to assess babies within the first 2 weeks of life. Depending on findings and assessment, we may also encourage baby to be seen for bodywork with an osteopath / therapist (ideally before and/or following tongue tie release) to aid in resolving residual tensions that may be in their head, neck, jaw, and bodies. (*Note: Red Flags that would encourage a recommendation of bodywork include but are not limited to: Asymmetries in nursing (e.g. pain only when nursing from right breast), reflux like signs and symptoms, generally fussy/signs of discomfort (gassy), gaze or breast preference, limited mouth opening, “trap door tongue” – muscles of floor of mouth and front of neck tight, pulling tongue downwards). At Little Bird, you will first meet with our new patient educator to learn about the connection between breathing, sleeping, tongue and lip function prior to the interactive assessment/examination. Following the assessment, treatment recommendations, procedures and post-operative care will be discussed. Our goal at LB is to ensure that our families feel comfortable every step of the way. For many children – if the tongue restriction (tie) is not severe but demonstrating sub-optimal function, we first focus on tongue/mouth myofunctional exercises that will strengthen the tongue and ensure that they are nasal breathing (for optimal health). As we re-train and strengthen the tongue, we will re-evaluate the tongue restriction to determine if a release is necessary. If the tongue restriction (tie) is significantly impeding function and/or the child is unable to master the tongue/mouth myofunctional exercises, at this point we would recommend a surgical release of the frenum (tie). *Note: For Adults – we conduct a comprehensive assessment, and if a tongue tie is noted and would benefit from a release. Following discussion and consent to proceed. Our adult patients will have pre-release myofunctional tongue/mouth exercises (that must be mastered prior to release). Following release, myofunctional tongue/mouth exercises are required and discussed for optimal results. Young children may require general anesthetic (asleep) performed by a medical anesthesiologist in the office due to need for excellent cooperation and optimal safe care. Reasoning is that the frenotomy (release) technique is different for children as stitches are used (acting like a bandaid) allowing for optimal post operative healing and comfort (and avoiding the need or requirement for intra-oral stretches). For older children and adults, a functional release is performed in clinic with the use of topical and local anesthesia that integrates myofunctional therapy (exercise program) before, during, and after surgery. The frenotomy technique performed by Dr. Sigal does not remove the frenum (as it is a normal part of our anatomy), but removes the restriction, allowing for it to function optimally with negligible inflammation or swelling (improving post-operative patient care and comfort). For example, the lip frenum may still appear as a Kotlow Class II, but it would function as a normal, non-restrictive, optimized frenum. Depending on patient factors including cooperation, treatment may be performed in clinic with local anesthesia (awake with numbing jelly and a few drops of freezing) or with general anesthetic (asleep) performed by a medical anesthesiologist in the office due to need for excellent cooperation and optimal safe care. Reasoning is that the frenotomy (release) technique is different for children as stitches are used (acting like a bandaid) allowing for optimal post operative healing and comfort. What is interceptive orthodontics? If we can ensure optimized nasal breathing and tongue function during the critical years of rapid growth (birth – childhood), we will be laying the best possible foundation for our children to reach their full genetic growth potential. The earlier the identification of any issues or concerns the better! If baby teeth were prematurely lost because of dental cavities/infection or trauma the maintenance of the space(s) will be assessed in terms of the overall development of the bite (occlusion). This can be done with simple cemented appliances. As soon as the diagnosis and etiology of the developing condition is identified, treatment will be recommended dependent on the cooperation of the child. Early treatment is recommended to optimize the development of an optimized airway and overall growth and development of the child. Our programs will incorporate Buteyko breathing methods and myofunctional therapy in a classroom (group) setting and/or private one-on-one sessions. For older children, teenagers and adults, following the establishment of nasal breathing with oral myofunctional therapy, traditional orthodontic care (i.e. braces) may also be recommended. This orthodontic care would be provided by an orthodontist recommended by Little Bird. What? Airway trumps all. If we can optimize or improve any individual’s ability to breathe softly, quietly, through their nose – we can improve their life. Buteyko breathing is for everyone. Even more however, for those with asthma or allergies, mouth breathing tendencies, or athletes looking to improve their endurance, reduce their heart rate, and improve oxygenation. Named after Dr. Konstantin Buteyko, the Buteyko breathing method consists of a series of breathing exercises and guidelines specifically designed to reduce over-breathing clinically known as chronic hyperventilation syndrome. The simple fact is that many people breathe too much, it has been reported that at least 50% of children are mouth breathers, resulting in over breathing (i.e. taking too many breathes per minute). Over-breathing alters the natural levels of gases in the blood, reduces oxygen delivery to tissues and organs, and causes constriction of the smooth muscles surrounding blood vessels and airways. This may lead to numerous health problems such as hyperactivity, headaches, and high blood pressure to name a few. Bringing breathing volumes towards normal and making the switch from mouth to nose breathing helps to alleviate such health problems. By re-educating breathing we hope to support lifelong health and well-being for our patients. Note: At Little Bird we will be offering separate Buteyko breathing workshops for adults, groups and sports teams. Please visit LB Workshops or contact us at Little Bird for further information. What is this? It is important that nasal breathing be established to promote optimized growth and development of the airway. If the nasal passages are blocked, this must be cleared in order to allow for the establishment of nasal breathing. What is this? Cavities represent the most common chronic infectious disease in the world caused by bacteria in the mouth. Did you know that babies are not born with this cavity causing bacteria? They only receive it through the saliva shared by their caregivers with untreated active cavities (i.e. through kisses, sharing of food and utensils, etc.). As such, cavities (and gum disease) can be prevented through education and an individualized risk management programs based on their risk level. Who would benefit? All patients seen at Little Bird would benefit from an individualized preventive risk management program. What is this? Snoezelen® (pronounced snooze–e–lin) Multi-Sensory Controlled Environments (www.snoezelen.info) are spaces that help reduce agitation and anxiety, but can also engage and delight the user, stimulate reactions and encourage communication. Snoezelen® can be described as an emotional and intellectual vacation. Snoezelen® involves the stimulation of the senses and provides an alternative way to interact with an individual.There is no restriction in terms of age or ability, Snoezelen® is for everyone, and provides the opportunity to bond and connect in a new way. They feature the use of imagery, light, auditory and tactile stimulation presented in a variety of formats. Little Bird Pediatric Dentistry is the first clinic to introduce the use of Snoezelen® with the delivery of clinical care. What to expect: Multi-sensory features are present throughout Little Bird for all patients to interact with, especially in the common waiting areas and in our Snoezelen® treatment/care room. Upon scheduling your initial appointment at Little Bird, our staff will ask a few key questions in order to determine the most appropriate space for each patient. For patients desiring care in the Snoezelen® treatment room, we will gather personalized information to customize the room to their unique needs. In addition, they will receive 5 minutes before and after their appointments to enjoy the space with their caregiver and/or family member. Over time, a customized Snoezelen® profile will be established for our patients at Little Bird. Snoezelen® Multi-Sensory Community Time: We will be offering community time for individuals, families and groups to come and interact in the Snoezelen® space for a small fee. Please click here to learn more! Fourth appointment may include an introduction to oral hygiene, provision of tooth cleaning, etc.As family members and caregivers know their loved ones best, our LB staff will rely on your suggestions as to the number of stages and what care may be best provided at each appointment.Furthermore, group homes (or larger groups) may come to Little Bird at the same time, spending time in the open Snoezelen ® classroom space. On the same day (or at set times), welcome each individual separately with their caregiver into the Snoezelen® treatment room for their consultation/assessment and/or on-going care.It is our hope that through creating these familiarization programs at Little Bird that our patients will feel comfortable, and receive more routine, preventive care thereby reducing their risks of future cavities, oral disease and associated discomfort. Social stories provide a guided path towards an experience or the completion of a new task such as going to see the dentist. Social stories can be written as in a book, visual as in a video/pictures, or combination. At Little Bird, we encourage family members and caregivers to visit the practice (during specific times offered) to tour, experience the space, and take their own pictures, in order to create personalized social stories for your loved ones. Please contact us to learn more about this service. What? Physical activity obtained by bouncing on a trampoline has been shown to improve behavior, induce a calming effect and may improve one’s well-being in addition to providing physical activity. The rhythmic motion and release of energy is responsible for the “calming” effect. What to expect: Little Bird will have a Health Bounce B-Pod™ which is a rebounding device (trampoline) that uses a padded C-frame handle for upper body support providing additional stability and safety. Patients may use this before or after their appointments at Little Bird to enhance their overall experience. This may be discussed with the parent, caregiver and/or patient at the initial consultation appointment or incorporated in an individualized familiarization/desensitization program. What to expect: Little Bird Pediatric Dentistry will partner with community service providers for the hearing impaired to provide American Sign Language interpretation services during appointments and visits on an as needed basis. In order to best accommodate each patient’s needs, the need for these services should be identified when the patient is referred to Little Bird, or when the first appointment is scheduled with our LB staff. Little Bird Philosophy: Despite all of our best efforts some children and patients may still develop cavities, which unfortunately can be seen as early as the first year of life. Little Bird Recommendations: Various materials and options exist for the management/treatment of dental cavities that our staff will explain to you (pros/cons/costs), to help you make an informed decision. Our recommendations are based on maintaining the natural baby tooth in its functional state until exfoliation (natural loss of tooth), and for permanent (adult teeth), for as long as possible. Longevity and durability are the key factors relating to our evidence based material recommendations, followed by function and esthetics. Only if a tooth is not restorable (due to large size of cavity, severely broken tooth, etc.) then extraction (removal) is recommended with appropriate management of the space (as needed) as it pertains to the occlusion (bite), function and esthetics. Little Bird Philosophy: Everybody is unique and each child / patient seen at Little Bird will be assessed at each appointment to determine their ability to cooperate for the care that they require. An individualized behavior management plan will be developed to ensure that treatment can be provided efficiently in a manner that is both safe and effective for the patient, caregiver(s) and staff. Your approval is required before any such plan is provided. Some individuals may still require the use of pharmacological (drug) behavior management in order to provide their required care in a manner that is safe for them, caregivers and our staff. General Anesthesia (asleep) provided by a medical anesthetist and pediatric nurse at Little Bird. The facility and staff at Little Bird meet all the requirements of the Royal College of Dental Surgeons of Ontario to provide this care in the community. Referral to a hospital for required care under general anesthesia (operating room setting – asleep) based on the individual’s medical history and required treatment.